Tarryn Thomas has been highly touted for a few years now. The Tasmanian prospect caught the eye in his bottom age year playing in the Academy Championships mostly on the wing and up forward. This year he went to another level in the Academy Championships with his performance against Northern Territory down at Shepley Oval really catching the eye. He did it all in the academy series winning the ball at the stoppages and also proving a handful up forward with his marking on the lead and knack for finding the goals constantly on show. Thomas’s form in the National Championships was considered poor by some but his numbers where solid and although he did not have as many highlights especially up forward he was still able to win the ball through the midfield using his clean hands around the ground and neat skills. He had an up and down year after that but he finished the year strong kicking two goals and was amongst the best in North Launceston’s premiership win. 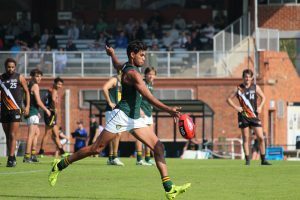 Thomas is tied to North Melbourne’s Academy and he showed his talent to the club first hand kicking two goals for the AFL Academy when they played North Melbourne’s VFL side earlier in the year. Thomas is a one-touch player who has proved his skills on many occasions. Through the midfield he times his attack well often getting good touch and releasing the ball quickly by hand or by foot. When forward he leads with intent and is often clean with his hands out-front but if the ball comes to ground he is quick to pick it up and attack the goal face. He is a hard matchup when forward because of his height and ability at ground level and has been effective coming out of the square. He shows class with ball in hand which goes well with his clean hands around the ground. Thomas will often know when to hold onto the ball or quickly get rid of it and often takes the right option. His kicking is good both short and when kicking long which is an important attribute. Thomas moves well around the ground with his speed and agility to go with his height makes him a hard player to tackle in the contest and his balance on the outside usually holds him in good stead. He moves well in traffic and is often composed when he has the ball. Despite having the lighter frame and exciting attributes is not afraid to win his own ball and tackle hard which he showed in one game in particular playing against Western Australia in the National Championships. He has a good tackling technique and he does not give away many free kicks. Thomas has a light frame so there is certainly some upside in terms of his development. There is not many glaring problems with Thomas, he ticks a lot of boxes which is why he is touted as an early pick. His form although decent in the National Championships was devoid of his exciting highlights especially forward of centre and although he had some standout games there was still a few quarters here and there where his impact was minimal so trying to become a more consistent four quarter player could hold him in good stead. The reason behind his inconsistency was both his travel (played all over the country between Tasmania and Allies duties) and his endurance which is still building. Once he slots into the North Melbourne elite environment, he will be able to produce on a more consistent basis. Thomas is still lightly framed and would need to add some more bulk if he is expected to play as a midfielder at the next level and finding his best position is another query. A goalkicking midfielder would be the desired outcome but he will most likely start his career on the wing or as a forward and he may need to improve his endurance to have an impact at the next level early on because of his light frame. Thomas is one of this years most gifted and talented prospects with his ability forward of centre and scope for improvement, despite his drop in form midway through the year he finished and started the year really strongly and his performance in a grand final cannot be underestimated. He ticks a lot of boxes that the modern day gun midfielder posses with great speed, balance, skill, height and the ability to impact the scoreboard. Thomas despite his light frame should feature for North Melbourne next year purely on his talent, this is a kid that should become a star and he should be playing as much senior football as possible. Expect him to at least play in some games next season in the blue and white.